Preheat the oven to 350 degrees and line a cookie tray with a silpat (also called a silicone mat). Add all the ingredients, except for the chocolate, into a bowl and stir to combine. Form the dough into macaroon shaped cookies and line up on a baking tray. These cookies don't spread, so as long as they are not touching, they can sit pretty close to one another. Bake for 10-12 minutes or until the edges are golden brown. Set aside and allow to cool. In a double boiler, melt the chocolate. 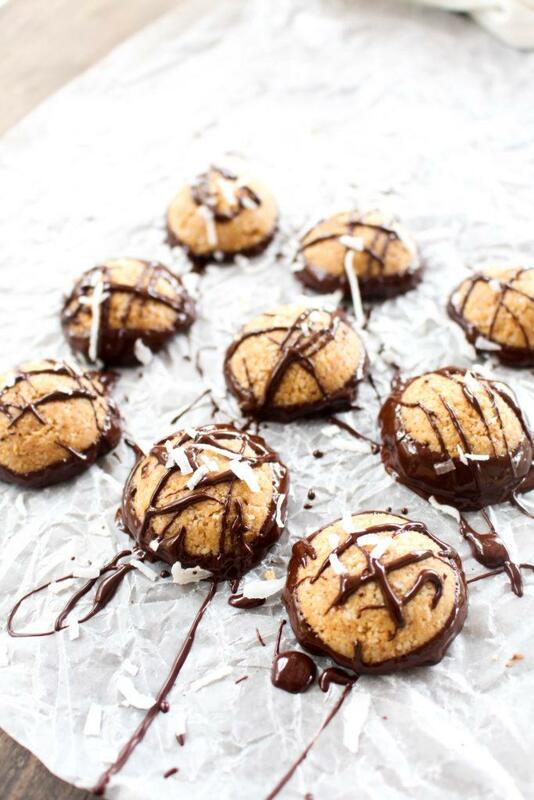 Dip the bottom of the macaroons in chocolate and set them on wax or parchment paper to dry. Drizzle the tops with chocolate as well. Once the chocolate hardens, serve.